At this London branch of a US chain, your Italian ice-cream comes shaped as a flower. At least it does if you ask for a cone on which ice-cream slabs, rather than scoops, are formed into ‘petals’ atop a crispy waffle. The petals can be made from as many flavours as you wish – even if you choose the small size. This is a handy innovation, as the vast array of flavours can be a bit hit and miss. A juicy passion fruit offered a tangy freshness, which complemented the dark chocolate hit from the chocolate sorbet; however, tiramisu tasted rather artificial, and the fabulously named L’Inimitabile, a nut-flavoured chocolate, was just too sweet. If you fancy something more substantial choose waffles, crêpes or brioches – all served with or without ice-cream. A small selection of chocolates and sweets is also for sale. The shop itself is small, with dark brown wood furnishings that make it feel even more so. Still, there are enough tables to seat up to ten people at a time and you’ll even find a few chairs outside on the pavement. 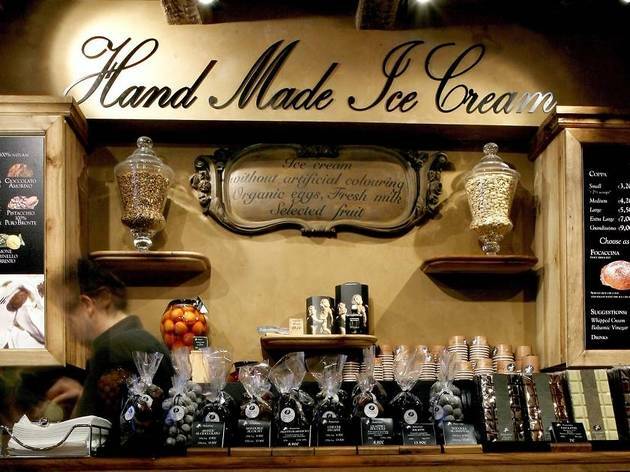 We are an authentic Italian gelateria serving the highest quality gelato and sorbets, along with decadent sweet treats. Our gelato is churned using only the freshest ingredients, with no colourings or artificial flavours. Each gelato is served as a beautiful gelato bouquet; almost too pretty to eat! Amorino does great gelato ice-cream and their rose petal creations are so incredibly pretty too. I really like the taste of the gelato here and would say it is similar to the real stuff. They offer a decent variety of flavours and allow you to to choose as many flavours as you want with optional extras of cones and macarons. They also offer waffles, crepes, frappes and granites along with hot drinks here but the main draw for me here has always been their ice-cream. Amorino renowned for its rose sculpted presentation on a cone is a very successful international chain that sells Italian gelato with branches all over London. On a Saturday night, I headed down to their place in Soho and joined a queue that had gone as far as the pavement outside. It was a small cosy spot. Service was swift. From a large selection of flavours, I opted for the largest size cone. I picked the l’Inimitabile Hazelnut Chocolate, the Amarena which is vanilla and cherries and a slightly spicy biscuit called Speculoos. I was also given the option of having a macaron on top of my cone to compliment it but I decided not to. Just watching it being shaped in front of me into a beautiful flower was an artistic performance. As I took a bite of their gelato, it tasted indulgent, smooth and creamy; like no other. Amorino don’t compromise on quality. They source out the best ingredients like Alphonso mangoes from the Indian sub-continent, Grand Cru chocolate from Ecuador and pistachios from Sicily. As well they only use organic eggs. They even have vegan and gluten free options. From waffles, pancakes to candied chestnuts there is a wide selection of items to choose from. With a small cone at £3.90, a regular at £4.90 and a large at £5.90, prices are not cheap but generous helpings of gelato are served and the service is top-notch. There is a reason whyAmorino are so successful. I can't believe that this was my first time trying Amorino in London, after 3 years! I first tried gelato from Amorino when I was living in Paris but that was around 8 years ago, and since then I'd never had it again. My friend and I popped in after dinner in the area and decided to try a few flavours before choosing what we wanted. I immediately went for the Tiramisu because I'm a huge fan of the flavours of the dessert and I thought they'd translate well into a gelato. After trying a sample, I knew this was one of the flavours I wanted. We decided on Dark Chocolate for the second flavour we wanted on the dessert we were ordering, the Crêpe with 2 scoops of gelato. It's a classic combination to have gelato with a crêpe and we thought it best to share, given that I'm lactose intolerant and can't take that much dairy anyways. This turned out to be a good option, as the gelato was great - it was smooth, creamy, and didn't melt too fast. However, I was not impressed with the crêpe because it was pre-made! Once we ordered, I watched the lady behind the counter preparing it and she simply pulled out a frozen crêpe from the freezer to then heat up on the crêpe pan. This is quite shocking, given that a crêpe is really easy to make from scratch and inexpensive - the ingredients are basic and always readily available! That being said, for a pre-made crêpe, it wasn't that bad. It didn't taste fresh, but nor was it stale. I would most certainly come back to have their gelato again, but probably on a cone or in a cup next time. I like how pretty they make them look on a cone - shaping it like a flower and alternating the flavours. This is far from the cheapest place to buy ice cream or gelato in London. But the flavours are varied and imaginative (including plenty of non-dairy items), and the mixing of flavours into a flower shape is charming. As an Italian I have to admit Amorino is pretty good gelato. The price compare to Italy is very high but it's the same in other gelato'shops. Very good the fact you can mix 3 flavours with the small cone, something they don't allow you in other places and you have to pay by flavour. Funnily enough, my first taste of Amorino was on a trip to Portugal! After discovering it, I made a daily trip to the gelateria – sometimes even in the morning! Imagine my delight, then, when I discovered that Amorino was back waiting in London for me. I’m more of a cup, rather than cone, gal, but if you do opt for a cone, the gelato floral arrangements are a sight to behold. Simply pick a size, pay, and then choose as many flavours as you want! My personal favourite is pairing raspberry with dark chocolate sorbet. I visited the Notting Hill and Soho branches over the weekend and introduced two friends to Amorino for the first time. The weather was lovely, so we ate our gelato in the park, and it’s safe to say that my friends became converts. Deliveroo also offers Amorino…there goes my self-control (and my waistline)! Gelato is different from ice cream, everybody knows that! Having a great love for gelato, I am usually a pretty tough judge when it comes to places calling the ice cream they serve gelato if it doesn’t even come close to the amazing consistency of the gelatos I have enjoyed in so many small gelato shops in Italy. But to be fair, Amorino is a great place for authentic gelato in London! They have so many great flavours and even though I usually go for the same (raspberry, tiramisu or coffee, which are also excellent combined) they let you taste several flavours before ordering, if you are not sure what to go for. If you order you gelato in a cone they will make you a pretty gelato flower, which will almost certainly make you happier than an actual bouquet of flowers. During the easter period, they even put a small chocolate bunny on your gelato to get you into that easter spirit, so cute! Extra tip: Do not miss their gelato macarons - yes, you guessed it! Gelato inside macarons! They are delicious and so indulgent. I'm a dairy and gluten free eater and absolutely love this ice cream! They always have a chocolate sort, which is my fav. I would love of they got more flavours, but that's really the only complain. The prices are reasonable for this type of food. Wow I love icecream but this place really does make it special by doing the icecream in shape of a flower so pretty. The icecream is so smooth and creamy I was in ecstasy. Apparently no matter what size icecream you get you can have all the flavours not just one or two but you can have as many flavours you want from the selection that they offer. You just have to try the lemon sorbet its so sharp just how I love my lemon sorbet. So if you love icecream and real Italian icecream check this place out just seeing the iceceam as a flower makes me smile and feel happy even before I have eaten it. It was a hot summer's day.. the sun was beating my back like a carpet being beaten out for dust!! what I loved about this place was the fact that you could pick any size cone and they put as many flavours on it as you like!! they shape the ice-cream to look like a flower..a sweet ,melty flower which brings a smile to your face. My only criticism is that they could be a little more adventurous with the flavours. Other than that worth dropping in and having some! Gelato. Perfect gelato, smooth, pure, soft, perfect texture, rich flavours. Coconut is just mind blowing but if you like the dutch cookies "Speculoos" then you might have to try this flavour too! Just go to the counter, pay for the size you choose and let your instinct do the rest! For a regular sized cone I wouldn't recommend more than 3 flavours as you're going to get confused and won't enjoy it as much as it deserves - but that's just my opinion. But go for the cone, that beautiful flower shaped cone that they will make in front of you with petals from different flavours! Not only a pleasure to the mouth but to the eye too. Amazing Gelateria in soho! Highly recommend a visit especially in this hot weather. We went after a quick meal round the corner as fancied an ice cream to wander home with. Even at 8.30 there was quite a queue out the door so be prepared in hot weather to wait a while! I am sooo happy that the ice cream parlour round the corner from Amorino had a broken card machine, even if I did wait in the queue for 10 minutes before finding out. It was a blessing in disguise. I went in search for another ice cream parlour and ended up at Amorino where unlike the other place, I could have all the flavours I wanted and mix ice cream with sorbet! I went for a medium cup of coconut ice cream with pistachio and mango sorbets. Absolutely delicious. I should have probably gone for the small because I'd just had dinner but it was so good, I ate every last bit in the cup. Hands down the title of Best Gelatio In The West belongs to Amorino, with branches in Soho and Chelsea. Opt for different sizes of cups and cones but pick as many flavours as you can fit! My top 3 recommendations would be: salted caramel, amaretto and amarena black cherries and cream.Gelato tastes just as creamy as ice cream but actually has less fat per gram because of its ingredients and the way it's churned. Trust in the Italianos! I visited Amorino’s Soho outlet on a warm, sunny, afternoon, always the best time to enjoy gelato (or plain ol’ ice cream as it’s otherwise known). While I’m sure it would have been an agreeable experience to eat ice cream in the shape of a flower, I decided to opt for a run of the mill regular sized ‘cup’. I wasn’t quite sure what the ordering process involved but on enquiring was told I could have as many flavours as I wanted. Examining the size of my cup, I playfully considered challenging them by asking for as many flavours as possible, but then relented and selected just four instead, all of which were expertly crammed into the space available. I was also allowed to try a sample of each before committing to a purchase. All were rich and creamy with intense flavours and I enjoyed my £4.50’s worth. This Old Compton Street branch is quite small, but pleasant enough and as well as some seating inside, alfresco seating is also available, which is where most people were the day I visited, enjoying their gelato in the sunshine. Other items on their menu include waffles and crepes, along with the usual range of coffees/tea etc. A treat for those with a sweet tooth. I am first to admit that I am one of "those" people who refuses to go anywhere near Leicester Square or spend a penny when I do have to, so I was very reluctant to go into Amorino with my friend as she begged when we walked past. As an ice cream addict though, I couldn't say no, and however much my student budget cried as I purchased the smallest one they did - I didn't regret a thing. Well, except maybe not going for the next size up! The ice cream came shaped like a rose and unlike many ice cream outlets they let me have as many flavours as I wanted in this tiny cup. The coffee and cinnamon ones were unbeatable! I don't usually have a sweet tooth and ice cream is among the foods I don't really care about - even in summer. But after a friend has bugged me for weeks to go there I have finally given in two weeks ago. I have instantly been overwhelmed with the choices, but settled for a medium cup - I'm used to pay for ice cream by scoops and have been positively surprised when they told me that I can choose as many flavours as I like. Still a pretty hard decision, but no matter which one you try: you won't regret it!!! Although I ended up thinking if I should have tried another one as well. Luckily there is always a next time (and I never thought I would say this about ice cream ). If your looking for a special treat - you've found yourself the right spot. Ps: the macaroons look amazing too! Best ice cream in London and they make it look almost too pretty to eat. Amorino delivers high quality italian gelatos in the most romantic way: shaped like a flower. Using natural ingredientes, it’s possible to ad as many flavors as you wish in your gelato flower, as long as you ask for it in a cone. With a pleasant setting, the patient staff that will let you try as many flavors as you like before deciding which ones to go for. The shop is also home to over 40 different kinds of hot chocolate, and other goodies. Good choice for either hot or cold weather. 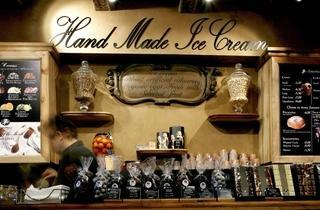 I have visited the Garrick Street branch in Covent Garden and had some delicious delicious ice cream. I ended up with a massive ice cream flower as I reverted to being a ten year old that couldn't make up its wide eyed mind. My favourite by far was the speculoos flavour which is an ice cream version of the gingerbread style biscuits you sometimes get with coffee. They had a couple of flavours of the month. I tried the basil ice cream, I won't be doing that again but I applaud their creativity. Found lots of public hair in my ice cream. Never going there again. Disgusting. The map location for Amorinoissompo.me/D0FAQRBE.SomPoint is a method to locate every point in the world using only 8 characters.You can convert every address and point on earth to only 8 characters. I was pleasantly surprised by the idea of shaping the ice cream like a rose giving you the opportunity to choose as many flavours as you want is very good and makes this place stand out. I loved the chocolate sorbet, the caramel and the flavour of the month "Torta al Limone". I was quite disappointed by Amorino and L'Inimitabile. The ice cream cone is very good so go for it and let yourself be tempted by the waffles :)It's a pity they didn't have all the flavours that they advertised on their website and in the shop itself and I think they should put some actual chairs in the shop instead of only stools. Sadly the service and the staff did not live up to the expectations of the lovely ice cream parlour set up in the heart of kings road. The gentleman taking our order really didn't want to be working especially on a Sunday! No smile and not a sign of happy welcoming service. Once we ordered soon after the crepes and milkshake arrived. Super quick service! The reason: the milkshake was not filled to the top and the crepes was COLD when we asked the waiter to re do it as it was cold we received a terrible arrogant attitude and told us this is how it's done. The big boss arrived and was even more arrogant and rude! Remember the paying customer is always right and when running such a place always provide service with a friendly attitude. The crepes was redone and practically slammed down the plate in front of us on the table not saying a word! A great shame as we will not be recommending this place to anyone or ever going back. Lack of friendly service and serious attitude! This ice cream place is the best one in london from my view, I love the way its handmade and it tastes super delicious and the way they out it into a beautiful rose shape which makes me not want to eat it at all! I think their ice cream is utterly very good and I like the fact that they seem to never run out of whipped cream and also the flower-like shape they are able to give to the cones is lovely. The staff is always friendly and well trained. Also the fact that there is no limit to the number of flavours that you can have is cool, I think. Personally, I am addicted to their Ecuadorean Chocolate. I have been a huge fan of Amorino for ages and always visit when I'm in France. I was really excited to see it come here. Of course, the ice cream is still as good, but for service I'd recommend going to the Kings Road branch instead - our server was beyond hopeless. This is definitely one of the best Ice cream parlours in London. Ice Cream done by weight so you can try as many flavours as you like!! Nutella is very good and pistachio. Just went there today as a lunchtime treat. I had their smallest size cone which would usually be the size of one scoop. Price was £3.30 which did seem steep. But when I selected the single flavour I wanted I was advised they could put more than one flavour in which is a nice idea for such a small ice cream. I thought it was beautifully presented in a cone with the ice cream made to look like flower petals. I really enjoyed the flavours and would definitely go back again for a special treat. Grossly over-rated place. £3.30 for a small ice-cream, and an excruciatingly long wait while the po-faced staff member (quite unnecessarily) shaped it into a rose. The vanilla ice-cream was just about OK but a long way from the best I've had in London. Avoid.